My 1-year-old son, Donovan, has brought more joy to my husband and my life than I can quantify. Donovan wakes up smiling, giggles when I give him Eskimo kisses and reminds us to cherish the little things every time he excitedly turns a page of a book we’re reading. He’s our world, so my husband and I wanted his first birthday party to be everything. We are after all, first-time parents. I didn’t however, want to break the bank or get so caught up in making everything perfect that the only memories I had of his party were stressful ones. So I started planning about two months out and tried my best to keep things simple and easy. Even with a moderate case of the “ooo-that’s-cutes,” which pushed my $300 budget up to about $450, I avoided spending the thousands of dollars some parents spend on milestone birthdays. Choose a date that works for your people. I chose December 15 based on what was most convenient for close family traveling from out of town. Afterall, they are the ones who helped me pull this extravaganza together, and they’re also the people who show up for my husband and I time and time again. There are no memorable moments without them. They are my people. Know who yours are, and prioritize them. Make sure you’re spending where it counts. For me, this was a venue that fit well with our theme and would take cleaning and entertainment off of my to-do list. 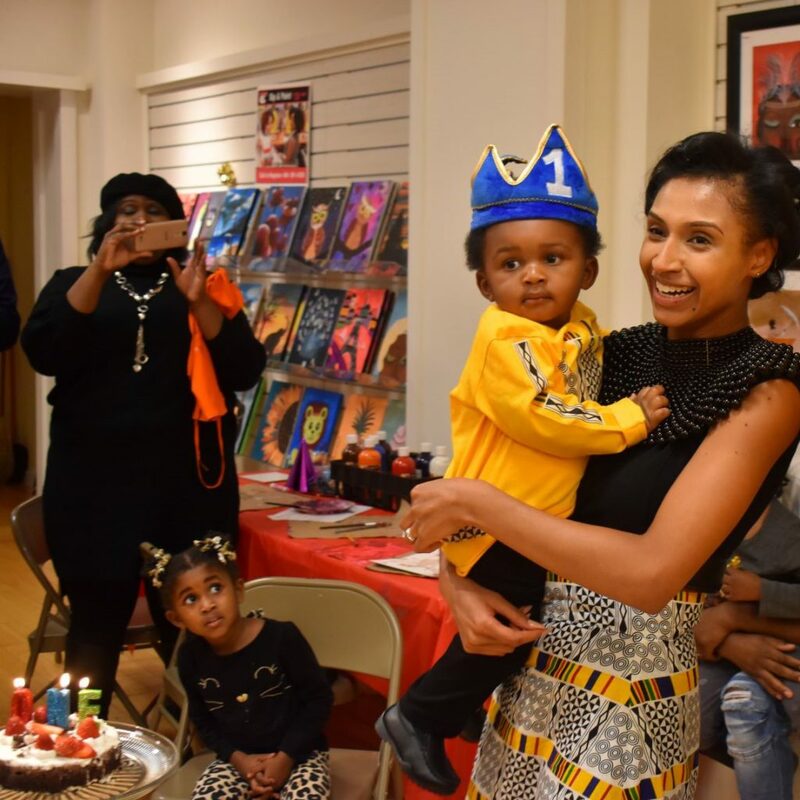 I chose the theme Storybooks, Paintbrushes and Wonder to tap into my son’s love of books and use his birthday as an opportunity to expose him to something new, painting. I searched through my bookmarks of black-owned businesses I wanted to support, and the art studio/ bookstore of children’s book illustrator R. Gregory Christie stood out. It’s called GAS-Art Gifts, and I simply could not have chosen a more perfect fit. Christie was a dream to work with. His store has beautiful artwork lining the walls, and he supplied tablecloths, tables, chairs and materials for guests to create original paintings. For $15 a kid, I covered venue, entertainment and decor. You can’t beat free with invitations, so I opted to email my guests a web link instead of mailing them invites. I focused on how to make Donovan a unique birthday webpage. I won’t lie. That was the most time-consuming part of the planning. I wanted the story to feel like a birthday wish for Donovan, and it ended up being exactly that. The story, “The Very Hungry Bookworm,” is about a little boy whose insatiable hunger for reading would one day help him become a brilliant young man. I finished off the web page with my favorite photo of Donovan and his dad, a link to RSVP and a photo slideshow that functioned as a lock screen. I also used the website to inform guests that they didn’t have to bring gifts and to give those who still wanted to buy gifts some ideas. The venue’s artwork was one reason I didn’t spend on decor, but I also opted to use mason jars, vases and wooden boxes I already had at home to create centerpieces. Everything else I purchased served a practical need and also worked with the colorful decor. I spent about $50 and a solid two hours shopping Party City’s clearance sections for napkins, candles, colorful straws, plastic cups, cutlery and swirled lollipop favors. Normally, I would recommend Dollar Tree, but I was trying to hit one store only to reduce stress. Plus, Party City had giant lollipops the cheapest I could find at three for $2. I used them as both favors and centerpieces. Get creative with your menu. Because I chose to do a 3 p.m. event, I did a menu of snacks and desserts. I got most of them from Aldi’s organic lines, and I incorporated all the foods mentioned in “The Very Hungry Caterpillar” on my buffet table. The adults snacked on pepperoni, salami, turkey, cheese, wheat crackers and bottled water, and the kids opted for cupcakes, candies, fruits and juice boxes. I added organic fruit pouches for the younger guests; marshmallow ice-cream cones instead of actual ice-cream; and generic cake and cupcakes from Kroger’s bakery. My mom and I topped the cake, a smash cake, with candles and fresh strawberries instead of the maraschino cherries it came with. And even when it got a bit smashed in transport, I was really happy with it. Use gifts to help with wardrobe. With the exception of an $8 smock, I didn’t get Donovan any new clothes for his birthday. My mom gifted him a birthday crown. He wore a shirt my sorority sister got made especially for him. And because I’m thirsty, I called her immediately to get the designer’s info for a matching shirt for my husband and a matching skirt for me. And more importantly than any amount of money spent, I don’t have a single stressful memory tied to Donovan’s special day. I remember laughing when he tagged his cousin and grandma with dots of purple and red paint. I remember his cousin teaching him to sip through a juice box straw. I remember canvases wet with thick paint, little fingers grabbing cupcake after cupcake and frosting spread from my son’s fingertips to my husband’s beard. I remember smiling, not worrying, and that’s priceless. How stinkin’ cute! I love the invitation, and the party sounds like it went perfectly. You go mom! Now, I must visit this bookstore. This was adorable! Way to get the job done. I can’t wait to plan my kid’s events once I start a family. I’ve never understood how parents could spend THAT MUCH on a baby or toddler’s birthday party!! Something that they won’t even remember, but it’s this need to impress and please. I love this lil art gallery first birthday. So cool. I can tell you though that I spent probably around $50 on a cute Teddy Bear party for my son years ago. Well birthdays are not something I need to worry about. I had no idea though that children’s parties cost so much. All of your matching outfits are so beautiful. Very good!! I remember planning my eldest daughter first BDay party. I was super overwhelmed and I simpled held it at Chucky Cheese . What really great tips! 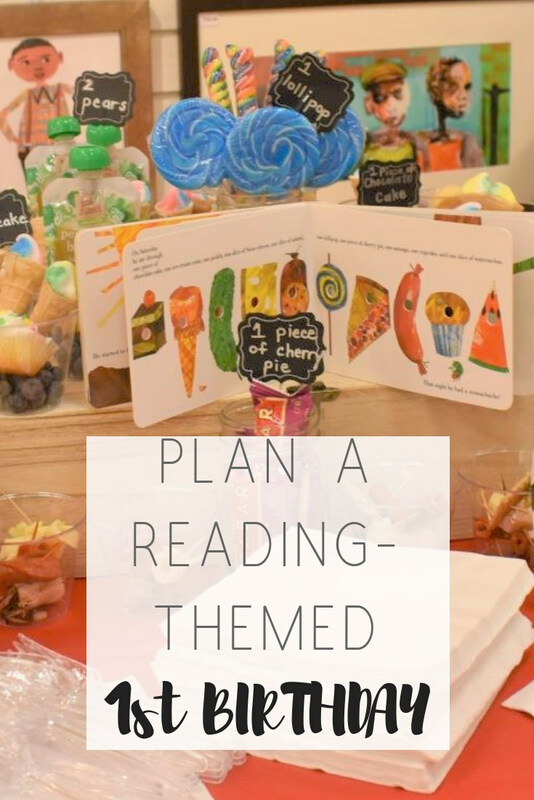 With 6 Kiddies I definitely had to learn how to plan a party in the most fun and still a budget-friendly way. You did a great job. I don’t believe in overdoing it for first birthdays either. You are proof that you can have a great party without breaking the bank. I love the minimalist birthday party theme. Some people go all out for a baby as if its their Sweet 16 but yes you did a great job! Awww so cute. Looks like a fun birthday. I was just talking with my friend about how people spend a lot of money on a babies first birthday. He’s so cute! I love that you didn’t break the bank. What a fun way to celebrate a first birthday! Love the theme and I must say that The Very Hungry Bookworm is one of my most memorable children’s books. Aww..such a cutie and I love the matching looks. Also, great space and I remember how time consuming parties for littles used to be, so kudos. How cute. I love the theme!